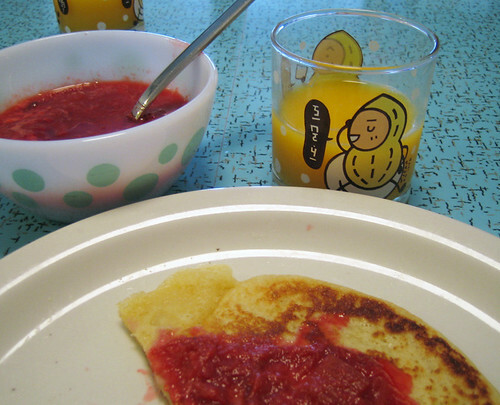 Our bags are packed, our apartment is tidy and we ate a great breakfast of pancakes with a fresh strawberry-rhubarb compote. In just a few hours, we’ll head to the airport ready to board our flight to Frankfurt. We’re very excited! While Cornelius has been to Europe many times, it will be my first visit and I’m excited and nervous about facing a 10 hour long overnight flight. I will have a post on the Food Network Canada’s blog, Food for Thought, coming up most likely on Wednesday. So definitely check that out next week and read about my adventures of shopping and living next to North America’s 2nd largest Chinatown! I’ll return with stories and lots of photos, I’m sure. See you in October! I was sent here by Lia. Your blog is awesome, and I look forward to getting a lot of inspiration from your posts, as I tire of my small menu repetoire! Soooo jealous! I am sure you are going to have an amazing time. Can’t wait for the reports! Have fun! Can’t wait to hear your stories when you get back!! Have a great trip. I know you are not around right now, but I tagged you for a meme for when you get back! You are a total original with a great big open mind..so you and Europe will be a great fit. I hope you have the time of your life and I can’t wait to see all the great photos you bring back (of food..and other things). Feels like you’ve been gone forever! I love reading your blog and am getting withdrawals! !